Designed by HASSELL, the new $92m Kolling Building for Research & Education is the first project to be completed in the redevelopment of the entire Royal North Shore Hospital Campus. The building which currently houses 350 researchers, education and animal house activities will eventually accommodate 500 researchers. It is well connected to the new main hospital building, allowing easy flow from the acute care area to the research area for the many staff members engaged in active clinical research. The new facility relocates medical research scientists, clinicians and educators from over twenty buildings spread across the campus into an integrated, shared facility. The consolidation of research and education activities has created a dynamic environment with a greater capacity for teams to share knowledge as well as resources. The Royal North Shore Hospital is renowned for its ‘bench to bedside’ research philosophy. This is where staff members are engaged in practical research that can be applied to patient care in areas such as cancer, pain management, diabetes and perinatal medicine. The Kolling Building for Research & Education, named in recognition of the hospital’s prestigious Kolling Institute of Medical Research, has its own architectural identity and discrete presence on site. The Kolling Institute of Medical Research (the Kolling), located at Royal North Shore Hospital (RNSH) was founded in 1931. It is one of the longest-established medical research institutes in Australia. The Kolling was named after a prominent businessman, Charles Kolling, following a generous in memoriam donation from his wife Eva Kolling. 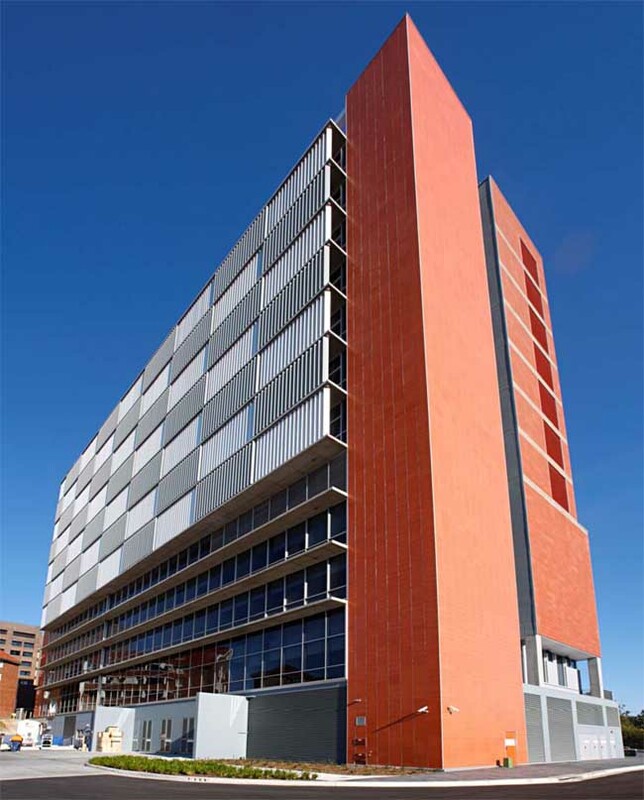 The Kolling Institute of Medical Research is the main centre for biomedical research at Royal North Shore Hospital, Sydney, and represents the discipline of Molecular Medicine within the University of Sydney. For over 80 years researchers at the Kolling Institute have been working on molecular solutions to medical problems by investigating the activity and the interactions of cells. Their goal is to learn improve human health by tackling a wide range of diseases that affect all ages. Its five major areas of specialty are Cancer, Renal and Cardiovascular Research, Pain Management Research, Bone and Joint Research, and Perinatal Research. The education space occupies the ground floor to level 3 inclusive. These floors are connected physically and visually via a staircase within a large void at the southern end of the building. Level one contains three lecture theatres of capacity from 200 to 70 seats, together with 12 tutorial rooms. The research laboratories occupy levels 4 to 10 and consist of a central open plan laboratory flanked to the south by laboratory support spaces, and to the north by office / write up space and meeting rooms. The footprint of each floor is approximately 1550sqm² of which, 760m² consist of PC2 certified labs and lab support space. The basement houses a large and a small animal house, including a small animal breeding facility. The small animal house and breeding facilities are certified to Physical Containment Level 2 (PC2) and incorporate a 70m² Australian Quarantine and Inspection Service certified quarantine zone. All small animal holding, procedure and behaviour observation rooms can be fumigated, with power and data provided to allow the operation of vaporised Hydrogen Peroxide fumigation equipment. A PC2 certified stair at the eastern end of the building facilitates pedestrian interconnection. In addition a portion of level 7 has been constructed and serviced to allow future licensing by the Therapeutic Drugs Administration. The building is clad in a proprietary terracotta façade system, in three differing shades, which adds colour and texture to the full height of the eastern and western facades, of the building, dramatically ‘book ending’ the twelve storey structure. Terracotta was chosen specifically because it is reminiscent of the brickwork that the original hospital was built from. With the new Kolling Building HASSELL has provided a superior planned and iconic solution to a complex brief; one which has been benchmarked to international experience and trends and was delivered on time and to budget.